Retreats enhance the programming offered on the LBT campus. These opportunities to “get away” from the hustle and bustle of daily life are offered to congregants of every age and interest group. Join our clergy, senior staff, and members of the LBT family for a wonderful weekend at the beautiful Brandeis-Bardin campus of the American Jewish University in Simi Valley, California. 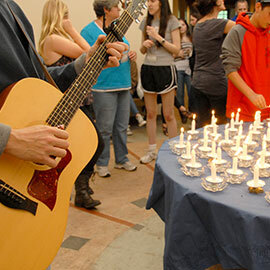 Each year, this annual weekend in April is filled with opportunities for everyone from all backgrounds and levels of knowledge to share Shabbat with other members of our Temple community. Whether you are part of a family with children (customized children’s programming for kids 2½ to 12 years-old is offered), or an adult without kids, this is an enriching time together with plenty of activities, including stimulating discussions, inspiring services, singing, schmoozing, eating, exploring, and relaxing. The next Community Retreat is scheduled for April 20-22, 2018 so mark your calendars now! Watch for additional dates and details in the coming months about all of our 2017 retreats – including our annual LBT Women’s Retreat, and our LBT Men’s Retreat.